Why do People Follow Then Unfollow on Instagram? This is something that bothers a lot of people and often a controversial subject. That’s why, in this article, we’ll go to the bottom to why people are following then unfollowing on Instagram. There’s a short answer and then there’s the more developed answer and we’ll cover them both. Short answer: Because they want the attention of the people they’re following. Long answer: People are following then unfollowing to get the attention of the people they’re following. But it’s more complex than that. When they begin following someone, almost one-third of the people being followed are following back. This means that by spam-following, they can grow their Instagram page quite quickly. Especially if you do this a lot. During Instagram’s early years, there were no restrictions on how many people you could follow or unfollow. Nor were there any restrictions on how fast you could perform these actions. As you can image, these features became misused very quickly and therefore, Instagram began putting restrictions on how you follow and unfollow users. Today, these actions are highly restricted, even to the point where non-spammers sometimes gets affected by it. Today, the maximum amount of users you can follow on your Instagram is 7500. Therefore, when people have reached this level, they have to start unfollowing in order to be able to continue following more users and ultimately grow their page. It’s a very effective way of growing your following, however, it is seen as spammy and could get you temporarily blocked by Instagram if you perform the follow/unfollow actions too quickly or too often. How to follow more than 7500 on Instagram? There is no hack for being able to follow more than 7500 on Instagram. Instead, the number is set in stone. If you’re a person who is using the follow then unfollow method on Instagram, you might have gotten yourself blocked for unfollowing on Instagram. Now, there might be other reasons for unfollowing than that you follow then unfollow on Instagram, for instance, if you want to start from scratch. But even then, you have to obey the rules, and you can be blocked for unfollowing on Instagram. 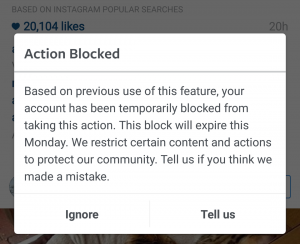 Instagram will block you from unfollowing accounts if you’re unfollowing too fast on Instagram. THere is no clear number for how many accounts you can unfollow on Instagram within what timeframe because this depends on things like the age of your account. If you’ve followed then unfollowed on Instagram, and gotten yourself blocked from unfollowing on Instagram, you won’t know for how long the block lasts, which can be a little frustrating. However, usually, the temporarily unfollow block on Instagram only lasts for a few hours. Sometimes, it can last for a few days. There are two reasons to why people are following then unfollowing on Instagram. One is technical, another psychological. Technical: Instagram allows your number of following to be max 7500. This is for a reason, to prevent spam and system abuse. So users constantly try to balance and keep that number lower by unfollowing to be able to follow more people. Psychological: Everyone wants to grow their followers and have a higher number of followers than the number of people they are following. The assumption is, if they follow you, you are very likely to follow back. Then, secretly a few days later they can unfollow you without you knowing so there you go – you follow them so it’s +1 followers for them. The follow/unfollow method is something that we can see being used by every type of individual that wants to grow their following. From brands to influencers. That’s because in this day and age, everyone wants to grow their pages quickly and the follow-unfollow is a way of doing so. In fact, the follow then unfollow method on Instagram has proven to be quite an effective way of doing so. The only thing that can be debated is how “ethical” it really is.